NL-B permanent lifting magnets are used for holding, transferring and releasing round or flat ferrous parts, particularly for thick loads. To minimize the possible damages from collisions, our detail-oriented engineer ensure our magnetic lifting device can withstand and last longer in harsh working environment. The lifting capacities are 330 lbs up to 4,400 lbs. There are three types with difference in hoist rings. NL-BV has a hoist ring on the side for vertical lifting. For every NL-B lifting magnets, we provide a full set of	services before and after your purchase. The magnetic plate metal lifters are handy and reliable to operate, leaving no scratch on the workload surface. They are good to lift flat plate metals, particularly for thin plate. The lifting capacities are 660 lbs and 1,3200 lbs. Pick up just a single 1/16" or thicker sheet from a stack, without clinging others. Ideal for quick manual transport plates or parts to increase productivity. Pick up and transfer ferrous parts, such as sheet metal, metal shavings, nails, screws, nuts, Frankford Arsenal tumbler pins, etc. To release the attracted parts, simply pull the T Shaped Release Bar upwards. A large sized plate cannot be lifted by a single lifting magnet because it could be bent and then peeled off after it is lifted. A spreader beam should be used to connect a few lifting magnets to lift a steel plate with large surface size. Armstrong permanent lifting magnets are composed of permanent magnet materials and mild steel structual parts which contributes a magnetic flux circuit. They are used for lifting ferrous parts without using any electric power. 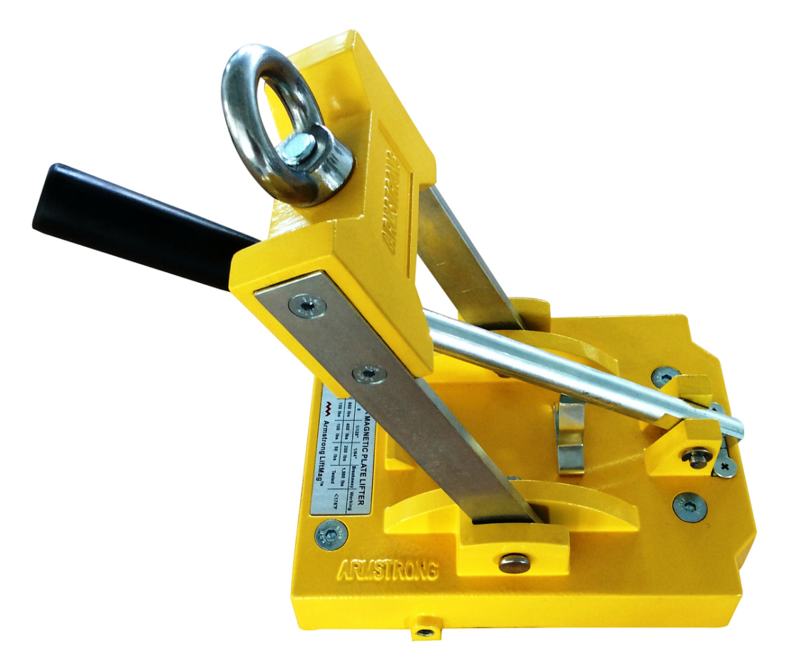 Lifting magnets are easy to operate and powerful, but also compact in size and cost effective. Armstrong permanent lifting magnets are widely used in machine shops, warehouses of steel parts, loading docks, shipyards, and many other sites commonly using steel products. There are two types of the permanent lifting magnets, NL-B and PL lifting magnets. Both of them have different magnetic structures, and consequently they are utilized for different loads. The handle controls an inner magnetic system for safe and easy operation. When the handle is placed at the OFF position, the lifting magnet would have almost no magnetic pull. 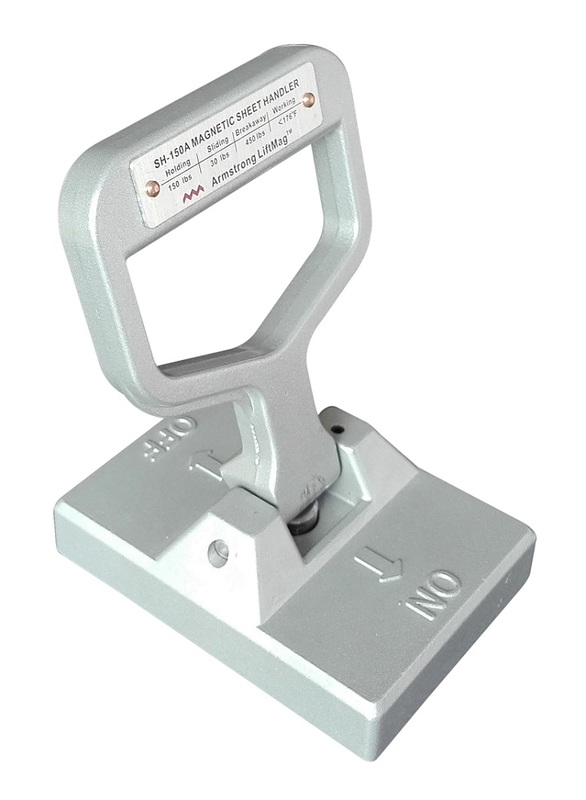 After you press the safety release button on the top of the handle and turn it to the ON position, the lifting magnet would then have magnetic attraction pull to a steel load. For better safety ensurance, the handle is secured at this position by a lock pin. The lifting magnet would preserve full magnetic pull until you manually slide back the lock pin and turn the handle back to the OFF position. 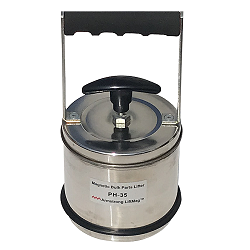 Thanks to neodymium magnet and special magnetic design, the Armstrong lifting magnets are compact in size and light in weight compared to their powerful lifting capacity. The lifting magnets have high resistance to demagnetization and is shielded from outside magnetic interference with mild steel case. The lifting value would always be kept constant and remain stable over time. - Armstrong lifting magnets can only be used at temperature below 148°F (64°C). 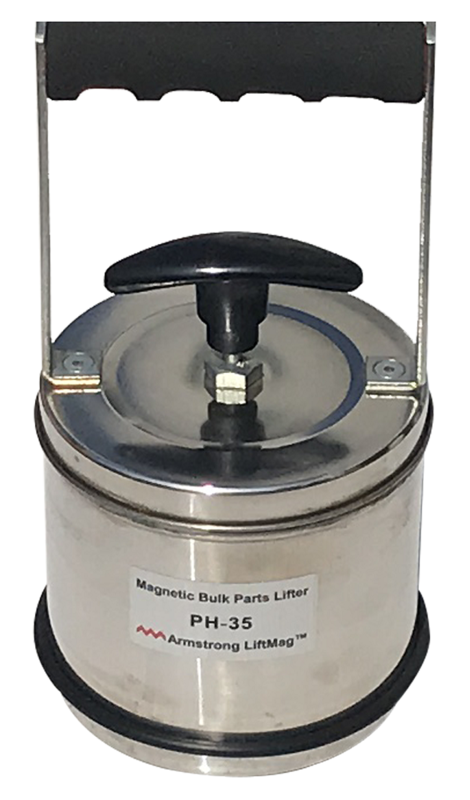 As the working environment temperature increases, the magnitude of magnetic lifting power would start to decrease. For the loads with high temperature, we would need to design a custom lifting magnet with a special structure and heat resistant materials. - Permanent lifting magnets are not recommended to lift a thin sheet from a stack, they could lift more than one sheet at same time. For thin sheet, please consider electro permanent lifting magnets, or electro magnets.